← Design Smart. Build Smart. Live well. Last summer over early morning coffee in Cambridge, Phil Bernstein – whom the past couple summers has joined me on the second day – asked me what I covered on the first day of my two-day Harvard GSD BIM leadership seminar. In all the times I’ve spoken with Phil, he had never before asked me to repeat myself. So I listed them for him. Oh those, he said distractedly – and returned to whatever he was doing. It was then I knew I was onto something. The convergences in question have both practical and emergent antecedents. Since the downturn in the economy in 2008, architects and other design professionals have been expected to design and construct in a manner that uses fewer resources, while still innovating, adding value and reducing waste. Deliverables have to take less time, cost less money to produce, while not compromising on quality: expectations that are unrealistic at best, often resulting in a negative impact on outcomes, working relationships and experiences. Old paradigms such as “Quality, Speed, & Price: pick any two”- no longer apply. Owners expect all three – Perfect, Now and Free – on almost every project. Traditional linear thinking no longer works in this converged upon world. At the same time, emergent forces and technologies have come together in the second decade of the twenty-first century that have developed to the point where they make real-time integration of all facets of the design and construction process possible. The metaphor of closing gaps is based on linear thinking: two events occurring in succession or transition are brought together or bridged. With increasing demands to make decisions in real time, design professionals are moving beyond the linearity metaphor and thinking in terms of simultaneity, super-integration and convergence. Emergent tools, work processes and the cloud make real-time convergence today a reality. Those in academia, the design professions and industry are experiencing a tectonic shift approaching a real-time/right-time meeting point marked by multidisciplinary integration, intersections, interactions – and daresay collisions. 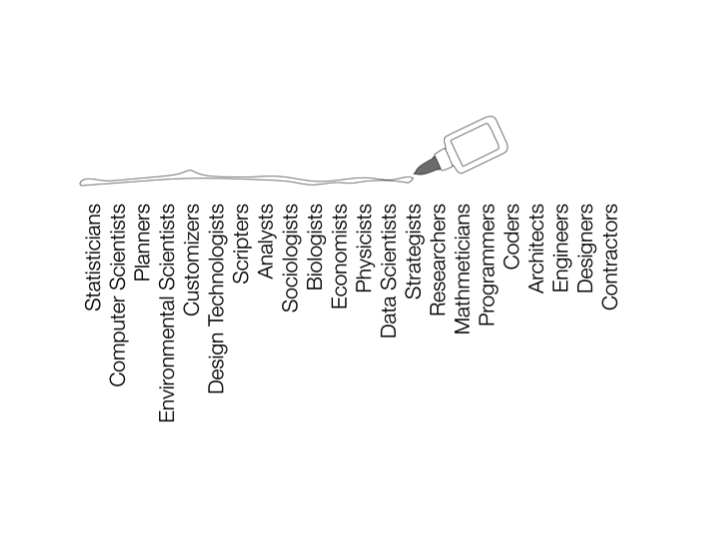 Because areas of professional expertise are converging on transdisciplinary teams increasingly made up of data scientists, computer scientists, mathematicians, sociologists, statisticians, strategists, scripters, and economists working alongside design professionals – it is no longer adequate for students of architecture, engineering and construction management, or for design and industry professionals, to strive to learn and master individualized skills. Being proficient in any one domain – whether skill, technology or tool – is no longer sufficient. As I’ve written elsewhere, being proficient is no longer sufficient. Adapting to the new world of work requires learning to think simultaneously on several fronts, and from several points of view. This is the world of convergence thinking. Real-time tools enabling man-machine interaction in design and construction are being developed on the UIUC campus. Augmented Reality and Virtual Reality is entering the construction space with implications for how buildings are designed. Software now provides intuitive, real-time answers to wickedly complicated questions, which in turn enables much better decisions. How can students of design and engineering, and their educators, work together to help leverage these tools throughout the building lifecycle? In lieu of buildings as buildings, or buildings as documents, we’re now seeing a convergence of buildings as data. Design firms are already leveraging data to make better decisions, bring about better insights, and make better buildings. Where do employees who can do this – understand buildings as databases – come from? How are they learning to effectively and creatively accomplish this? Is this something that can be introduced in school or in practice? Working with data and analytics not only informs, challenges and validates intuition, but over time changes (i.e. improves) intuition. Convergences such as the data/intuition feedback loop are quickly changing the way design professionals work, the way they think, communicate and interact with one another, and thus have implications for the way they learn, train, and practice. Existing BIM tools are in the process of becoming more computationally aware. Converging parametrics and computational tools. We are now able to compare alternative building designs on the fly – in real time – assuring teams that they are on the right track, meeting the owner’s and building inhabitant’s criteria, comfort and needs from the start. Converging processes and people. Using Grasshopper plug-ins like Platypus – developed by firm employees, not corporations, disseminated freely on Twitter, not via software resellers – individuals are now able to communicate and collaborate on the design of buildings in real time. Are architects going to sit side by side with hackers, computer scientists and algorithm builders? Right now, several offices already have architects sitting side by side with hackers, computer scientists and algorithm builders. The future, in other words, is already here. Are we preparing our students for this future? Who will lead this effort? Who, in other words, will be the glue? Tools are currently being developed where visualization reacts directly to analysis, in the 3D model, without the need of producing additional reports. What impact will this have on the way we currently teach structures, and the daylighting and energy analysis of buildings? Convergence of design and fabrication. University, not trade school, students today learn to operate robotic arm fabrication equipment directly from their CAD and BIM software. What are the implications for not only education and practice, but for the trades and industry? After winning the international design competition, it took Jørn Utzon 6 years to figure out how to build the Sydney Opera House shell structures, and by that time he was no longer on speaking terms with the client or the contractor. Flash forward 50 years: Nathan Miller as the lead computational designer, and later Andrew Heumann, leader of NBBJ’s design computational group, designed, fabricated and all but constructed the Hangzhou Stadium from their laptops. How are the boundaries between two historically separate entities, design and construction, converging? What are the implications for the way we learn? For the way we practice? As David Ross Scheer has discovered design professionals are increasingly challenged to realize meaning and agency within the constraints of computational tools. Who are the individuals that are succeeding at this need for the transference and making of meaning brought about by increasing convergence of technology, tools and processes? The seven convergences have implications for both education and practice. Convergence requires multidisciplinary participation, merging STEM subjects with those in design and the arts. We need to educate designers to work compatibly and effectively with those from across different domains and fields. Like it or not, this is where design practice is heading: we need to understand the implications for education and training, research and development. Architecture is a complex undertaking requiring the input of many individuals with varying interests, backgrounds and expertise. This has not – and will not – change. What is changing is the way these individuals are working, communicating and collaborating. Their individual contributions are converging. In response, they are integrating their efforts – not multitasking. To meet today’s demands for speed, affordability and quality – they are taking and making smart cuts, not shortcuts. They are currently learning to do this at conferences, at informal meet-ups, in online forums, via gaming, and in social media. If you aren’t in the Grasshopper forum, or follow them on Twitter, a whole epoch might pass you by. The linear design process transforms – and increasingly tightens – as a result of the introduction of convergences in contemporary design practice workflows. There is a need to clarify and concretize what is happening at this moment in time for those who aren’t following. Books – whether physical, digital or audio – are seen by some as antiquated technology. But in the middle of the second decade of the third millennium, they are still the best means we have for synthesizing moments and movements, giving them a name, and as importantly, a language that can be understood, shared and discussed by others. The seven convergences will be explored in a new book I will be writing in 2015. For those keeping score, convergence is the next natural succession in the research from my previous two books on building information modeling (BIM,) and data analytics in the AEC industry. Specifically, the practice-based research for this new book aligns with, grows out of, and builds on my current research on the collaborative leveraging of data in design that has led to my in-progress book, “Data Driven Design and Construction: Strategies for Capturing, Analyzing and Applying Building Data,” (John Wiley & Sons, 2015) a +400 pp. publication providing practical information, useful strategies and technical guidance to practitioners, educators and students who are looking to leverage data throughout the building lifecycle. As a meditation on the impact of technology on the education and making of design professionals, this new book – Convergence – can go a long way to help explain what is happening now in the world of design, as well as to discuss the implications for the future of practice. who has something to say on this topic. Email me at rdeutsch@illinois.edu or let me know by leaving a comment below. Leveraging software that to enable better decisions requires a robust, shared ontology, quantitative and qualitative metrics, sound processes/business practices, as well as transparency and collaboration. Has anyone truly accomplished this in the AECOO community? Critical…and cloud computing is driving this aspect. As process becoming transparent, change is more palatable. Somewhat important (aka 3D) but data visualization on the other hand is paramount. Traditional design life-cycle is antiquated. “Newer” collaborative construction delivery such as IPD and JOC will blur this area even further. See above… never should have occurred. Design a structure for an owner that you don’t know how to build? For a philosophy class perhaps? heading: we need to understand the implications for education and training, research and development. Linear design process is unacceptable, wasteful, etc. are traditional databases, and traditional design-bid-build construction delivery methods, yet all remain the norm. Will we truly change? When? AECbytes AECbytes is an online publication launched by Dr. Lachmi Khemlani in Nov 2003. It is focused on researching, analyzing, and reviewing technology products and services for the building industry. AIA Integrated Practice | Integrated Project Delivery Through an integrated project delivery method, owners, designers, and builders can move toward unified models and improved design, construction, and operations processes. Autodesk University Learn. Connect. Explore. BIM + Integrated Design The site you’re visiting right now! BIMwiki The mission of BIM Wiki is to be a living “Encyclopedia” of BIM knowledge and a community-driven site for all things BIM. Faster Cheaper Better Greener Why Integrated Design? Here’s why. IPD Toolbox A dialog between design thinking and project execution in an IPD context providing resources for teams. Paradigm Shift Explorations of Building Information Modeling (BIM) and sustainable design using technology as a catalyst for change in the architectural profession. Revit 3D The irrespressible Gregory Arkin’s infinitely informative and extremely entertaining industry blog. RevitOpEd Steve Stafford’s Blog ~ Revit OpEd = OPinion EDitorial ~ My view of things Revit, both real and imagined. Vico Software blog Vico executives and product experts share the latest news, trends, and opinions. What Revit Wants If you really give Revit what it wants, it will reward you. This blog provides specific, brief tips on BIM, Revit and I.T. Design Smart. Build Smart. Live well.